Title: Luzzi takes on different role. To some people football is just a game; to others it is something they watch with their friends or family, but to senior Billy Luzzi, it is a lifestyle. During a live scrimmage for Rose, Luzzi suffered an injury to his knee. “I was just blitzing, and their running back came out to block, and I hit knee to knee with him,” Luzzi said. Luzzi missed the first game of the season due to his injury and had to wait until Aug. 29 to find out the future of his high school football career. Luzzi tore his ACL, an injury that usually takes six to nine months to heal, ending his high school football career. This not only affected the life of Luzzi, but his team as well. 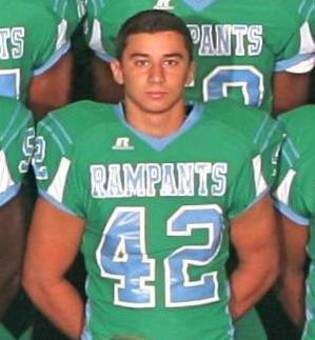 Luzzi had been a starting linebacker on varsity since he was a sophomore and was a leader to the whole team. Using Luzzi’s injury as motivation, the team is hungry for a championship. “I use Billy’s injury as motivation for me to play harder because that injury could happen to anyone” said junior Jair Phillips. He will not be able to come back for the Rose season, but playing in college is still an option. Last summer Luzzi went to several colleges on official football visits. Football is Luzzi’s passion, and he is not ready to give it up, but not being able to play his senior year may affect his scholarship offers. “I could still get a scholarship to a smaller school, but I’ll probably end up walking on at a division I school,” Luzzi said. Luzzi started physical therapy Sept. 5 and is working with the same physical therapist that East Carolina University’s football team uses. Physical therapy is not all he wants to do this season. He also would like to help out the team as much as he can. “I’m planning on helping everyone out. I’m helping coach varsity, too, by pointing out any mistakes I see.” Luzzi said. Luzzi staying on the team to help means a lot to the players. “He cares about this team as much as any of us, and for him to come out to the games and help coach just shows the passion he has for this sport,” Spell said. According to Luzzi, tearing an ACL is a very painful injury. “It was the worst pain I’d ever felt in my life, but it only hurt for about 30 seconds. After that, I was able to walk off the field,” Luzzi said. According to Spell, losing a linebacker who has started for the varsity team since his sophomore year will have an affect on the team. Even though Luzzi cannot be out on the field playing anymore this year, Luzzi said he still believes his career is not over and also believes in the coaching and skill of the players to have a successful season. “There’s nothing positive about this situation, but if anyone can come back from this injury it’s Billy, and hopefully he’ll come back stronger than ever,” Spell said. Even if Luzzi is done playing football for Rose and may not get to play in college, he is still proud to have played here. “Through it all I’m just just honored to say that I am and always will be a Rose Rampant,” Luzzi said.